﻿ Selenium a major antioxidant , protects cell membranes may prevents free radical generation. Besides selenium, Dr. Wallach's Ultimate Selenium contains copper, vanadium and chromium and zinc. Zinc is believed to prevent and help to reverse acne, depression, anorexia, fatigue, impotence and infertility. People deficient in the trace mineral Selenium may be less able to fight off disease, suggests new UK research. The study supports previous evidence of Selenium's role on the immune system, vital to protect against diseases like cancer, and also underlines potential problems with the decreasing levels of the mineral in the wheat supply in many European countries. The human body needs trace amounts of selenium to perform a variety of functions, including synthesizing antioxidants shown to protect against cell-damaging free radicals. 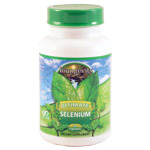 Since selenium can’t be manufactured by the human body, it has to be obtained from diet or supplements. Dtox fx Natural Detoxifying Ingredients by Dr. Joel Wallach. Copyright © 1993-2015 CBS All Rights Reserved.